What Do You Bid On This Showcase? In memory of Army Staff Sgt. 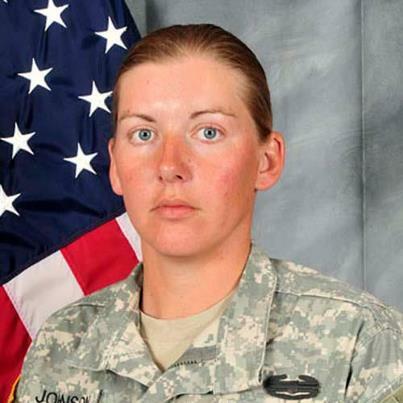 Donna R. Johnson who gave the ultimate sacrifice to our nation in a suicide bomber attack while on patrol in Afghanistan, on Monday, Oct. 1, 2012. Staff Sgt Johnson is survived by her wife Tracy Dice. In days to come, the American Military Partner Association will be sharing more of the story of Donna & Tracy and their commitment to each other and our nation. We ask for your continued thoughts, prayers, and privacy for Tracy and her family during this difficult time. The Army Times has published an Associated Press report. The remains of Sgt. Donna R. Johnson, 29, of Raeford, Sgt. Jeremy F. Hardison, 23, of Browns Summit and Sgt. Thomas J. Butler IV, 25, of Leland, were flown into Dover Air Force Base Tuesday evening. The three died Monday in Khost, Afghanistan, after an insurgent detonated a suicide vest while the guardsmen were on patrol. The soldiers were assigned to the 514th Military Police Company, which is based in Winterville. The bomber struck about 9 a.m., shortly after the troops got out of their vehicles to walk through a market area in Khost, located in the eastern part of the country. The others killed included an Afghan translator working with the American troops, four local police officers and six civilians. Three more American soldiers were wounded, according to a military spokesman. About 60 Afghan civilians were also injured. A Taliban spokesman contacted Western media to claim responsibility shortly after the attack. The AP notes that both of the other two soldiers killed had wives, but makes no mention of Sgt. Johnson's wife, who also serves in the military.